Marine ecosystems are dynamic and fluid environments. Sessile organisms must cope with the variable conditions delivered to them, whereas motile species either drift or move in response to local conditions. When the physical and chemical environment changes, there are numerous possible outcomes and responses by the constituent species. A focus of current marine ecosystem research is to understand how changes in driving variables (such as increases in fishing effort, warming sea temperatures and increased concentrations of pollutants, with concomitant decreases in pH and habitat degradation) will affect species composition and productivity. In the past two decades, studies of marine ecosystems under global change have received much attention.1 The goal of these studies is to predict how continuing changes might manifest in the face of global pressures. Organisms are able to adapt and evolve to accommodate changing environments, which might introduce unpredictable elements that can be responsible for further changes in those environments. A number of well-publicised collapses have occurred in marine fisheries, some of which have subsequently recovered (e.g. the Black Sea anchovy Engraulis encrasicolus fishery in the 1990s2) and some of which have not (e.g. the north western Atlantic cod Gadus morhua fishery in the 1990s3). Although post hoc explanations are often used to explain the observed changes, it is extremely difficult to try and predict them in advance. 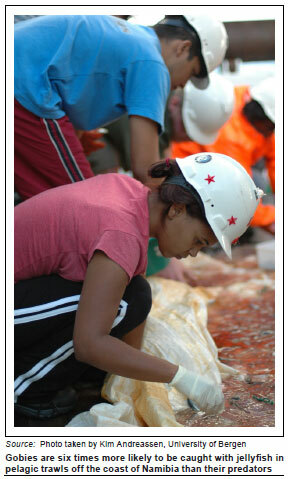 Historically, Namibian fisheries were among the most productive in the world. In the late 1960s, catches of sardine Sardinops sagax peaked at more than 10 9 kg, after which catches rapidly decreased in the 1970s and by the 1980s the fishery had collapsed to very low levels.4 Recent catches of sardine average less than 30 x 10 6 kg per year, a reduction that has been ascribed to both overfishing and environmental changes.5 Similar considerable decreases in anchoveta Engraulis ringens catches occurred off Peru in 1971-1972,6 in a similar marine environment with similar species composition to that found off the coast of Namibia. Whereas the Peruvian anchoveta fishery recovered within 20 years, the Namibian ecosystem has shown a profound alteration in species composition and productivity that has persisted for four decades. Recently, a multidisciplinary multi-national study attempted to understand some of the reasons for this non-recovery. In a recent article published in Science,7 contributors report on the unique ecological role of the bearded goby Sufflogobius bibarbatus in the Namibian continental shelf ecosystem and some of the extraordinary adaptations shown by this species. The study conducted by Utne-Palm et al.7 is a good example of how a species has been able to take advantage of the changes to a marine environment, with ecosystem-wide ramifications. 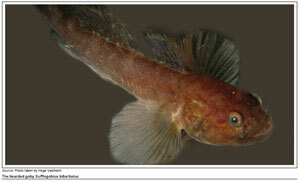 Bearded gobies can survive in seawater with very low oxygen concentrations (as low as 5.3% saturation) and high sulphide concentrations (1 mmol - 2 mmol), apparently by combining metabolic depression with anaerobic production of adenosine triphosphate (ATP).7 Acoustic data show that the fish spend their days in these seemingly inhospitable conditions near the sea bottom, often buried in the diatomaceous mud that covers the seabed along much of the Namibian coast. Here they are able to feed, ingesting the sediments and nutritious material contained within them, such as bacterial mats, benthic diatoms and polychaete worms.7 However, to conserve oxygen, digestion appears to be delayed until night-time, when the fish move up in the water column to more oxygenated waters (shallower than 80 m), a depth zone that is usually occupied by large jellyfish. Since the collapse of Namibian fisheries, there has been a marked increase in jellyfish biomass, particularly for two large species: Aequorea forskalea and Chrysaora fulgida.4 Jellyfish outbreaks have been occurring with increasing frequency in other parts of the world, often associated with intense fishing and hypoxic events (i.e. low-oxygen events or dead zones such as a 22 126 square kilometre region in the Gulf of Mexico, where the Mississippi River dumps high-nutrient runoff from its vast drainage basin). Jellyfish are believed to represent a 'dead-end' food web, because few species are known to consume them in large quantities. Sea turtles are among their best-known predators, but there are too few turtles to influence jellyfish numbers. Using stable isotope analyses of muscle tissue from bearded gobies and various other species, Utne-Palm et al.7 showed that jellyfish were a dominant component of the diet of bearded gobies (i.e. ranging between 17% and 60%), contributing more than the foodstuffs obtained from the mud. It is not clear whether the jellyfish are eaten during the day, when the bearded gobies swim among them, or at night, when they might encounter dead or moribund jellyfish that have sunk to the sea floor.7 Either way, keeping in mind that both might occur, the net effect is that bearded gobies form a link between primary productivity in surface waters (fuelled by photosynthesis) and benthic productivity at the seabed (fuelled by chemosynthesis in the form of sulphide-oxidising bacterial mats and chemolithotrophic bacteria). 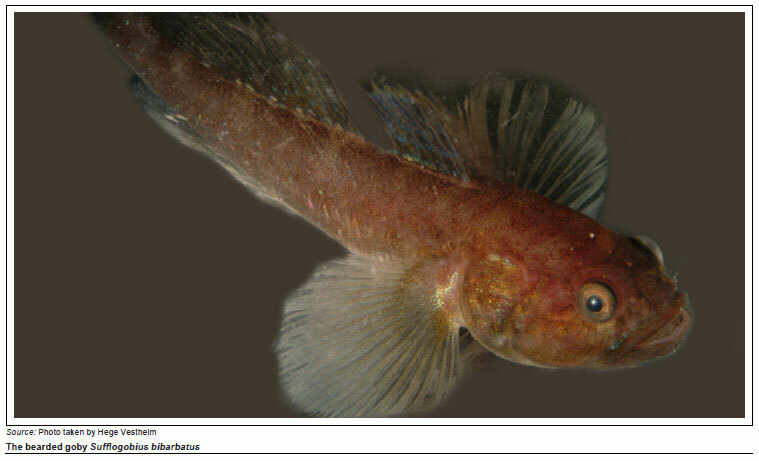 The study conducted by Utne-Palm et al.7 shows how unusual attributes have allowed bearded gobies to take advantage of the changes that have occurred in the Namibian ecosystem and to thrive in conditions that are inhospitable to many other fish and invertebrates. It highlights the need to understand the context and the natural history of species in ecosystems in order to understand likely changes. But just how unusual is Sufflogobius bibarbatus among fish species? Are there other species with similar attributes that might become influential in ecosystem dynamics under global change, especially in environments prone to hypoxia? The study makes a fascinating and important contribution to our understanding of species interactions in the Namibian upwelling system. It involved the efforts of 19 scientists from six countries, including from Namibia and South Africa. The project originated from a regional project of the BENEFIT programme on bearded gobies led by Mark Gibbons from the University of the Western Cape, one of the co-authors of the Science7 article referred to earlier. According to Gibbons, the study would not have been possible without the international collaborators, who provided expertise in basic disciplines that currently have few or no practitioners in southern Africa, such as marine physiology and marine behavioural ecology. The study provides a good example of the benefits of research collaboration, with a circle of expertise flourishing from a few initial collaborators to the multidisciplinary team that went to sea on the Norwegian research vessel, the G.O. Sars.